Last edited by Chris E on Sun Jun 07, 2009 3:46 pm, edited 2 times in total. Hi, long time reader, first time poster, etc. To the left of the building pictured above, there was a small rundown house and what looked like a mechanic's garage. I say "was" because last week, I noticed that they're now gone. Being interested in older buildings, I had always wondered what they were and if they were still being used. Now that they're gone, I'm even more curious about them. Does anybody have any information about them? By the way, the removal of the buildings has revealed an old painted advertisement on the wall of the above building. I think it was a cigarette ad but didn't get a close look as I passed on the train. My mistake! On passing it again yesterday, I see that only the garage has been knocked. The house is still there. Maybe if you get a chance snap a pic of that Ad and post it! Got a chance to get a couple pictures today. I think the building in the middle below may be the same one as above. View of the intersection of Macleod (2nd Street) and 25th Avenue SW, taken from Reader's hill looking NW. Based solely on counting the windows on the side and front in the above photos, it would seem to be the same building. Looks a lot better without all that crap siding on it. This was the company that produced the famed Honus Wagner baseball card . Sweet Caporal cigarettes in 1915 pulled its Honus Wagner card from the market after the slugger complained he didn't want kids to see him associated with tobacco products. (Revisionist theory says the penny-pinching Wagner was upset for not being compensated for his photo's use). The set's Wagner card is one of the most desirable pre-war cards on the market today, and one recently sold for $2.8 million. (sorry you will have to search for it near the bottom of the page. newsposter wrote: I think the building in the middle below may be the same one as above. 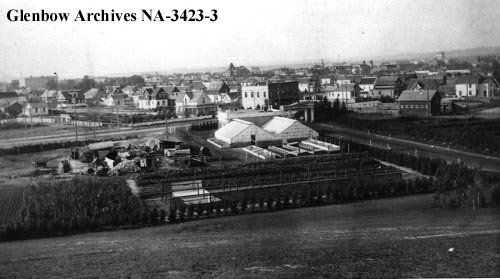 View of the intersection of Macleod (2nd Street) and 25th Avenue SW, taken from Reader's hill looking NW. I haven't gone by this way in a few weeks, but I happened to be in Union Cemetery at this very spot, and remembered this photo and the discussion of the building. So, I looked down the hill at it, and, well, it's gone! The lot is completely bulldozed, with no sign of there having been a building there. Yeah it was sadly demo'd in the past month or two.